Recently I’ve noticed a few more wireless networks crop up near my place, so I’ve been meaning to check I’m still on the right channel. Seeing as I was doing the checks I thought it might be useful to write a few notes on what to check for. First a little technical background… Wi-Fi networks all operate in the same 2.4GHz band of the spectrum. To allow many networks to work within the same vicinity the range is broken down into a number of channels (11 in the US and 13 in Europe). Think of these as the frequencies of radio stations, each has a discreet band of its own. When you set up your Wi-Fi network your router or access point will be set to use one of these channels. That sounds great eh? Unfortunately, as you can see from the diagram above, to squeeze in enough channels many of them overlap. What that means in practice is that if your network is on a channel that overlaps with your neighbours both of you will probably suffer reduced performance. To get around this problem, you can check what channels are being used around you and set your network to one that has the most clear signal. The easiest way of doing this is to download a Wi-Fi monitoring tool and use that to analyse the surrounding networks. 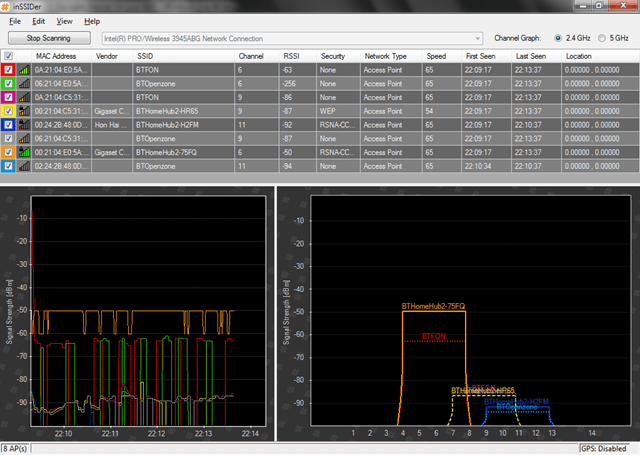 I’ve used inSSIDer from Metageek before as it gives you a nice graph which helps visualise the networks. So in the screenshot below you can see that the orange network is set to channel 6 (the mid-point of the range), but that the dotted yellow network is set to channel 9 and overlaps it slightly. Setting the orange network to channel 1 would move it out of the interference of the other networks, and should therefore speed it up. If you’re having problems with your network it’s worth trying this out and seeing how the networks around you could be affecting yours. You can usually set the channel for your network within the control panel for your wireless access point or router. Give it a go and see. Not only have I used inSSIDer to find the optimum channel for my WiFi – I’ve also sent screenshots to my neighbours to persuade them to move theirs around too… :-) Interference free bliss!